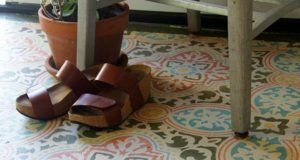 Home / Design + Inspire / Travel + Discover / International Painting Retreats / New Moroccan Stencils on the Horizon! Hello! I recently returned from my 5th and latest international decorative painting (Peacock Painters) retreat to Marrakech, Morocco and I’m still basking in the warm glow of new and renewed friendships, the beauty of the country and its people, and the amazing stencil and painting projects we completed there as a group. We experienced 12 gorgeous days together stenciling, feasting, trekking, shopping, touring, and experiencing the unique loveliness that can only be found in Morocco. 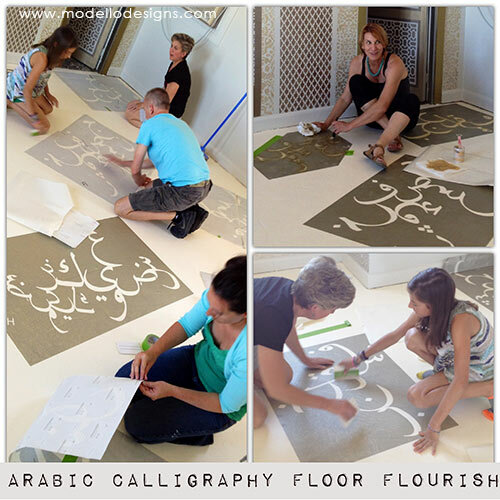 Our primary stencil project for this trip was an intricately patterned 16′ x 11′ feature wall in the master bedroom, but we also stenciled some lovely furniture pieces and even did some stylized Arabic typography patterns on the floor with some newly designed Modello® masking stencils. I am chomping at the bit to show you just how beautifully this room turned out! We chose a stencil color palette of soft shimmering metallics and used colors from our line of Royal Stencil Creme stencil paints for maximum shimmer and fast coverage. Alas, the final result is slated for a design magazine publication like many of our other stencil projects there, so THAT will have to wait, my dears. 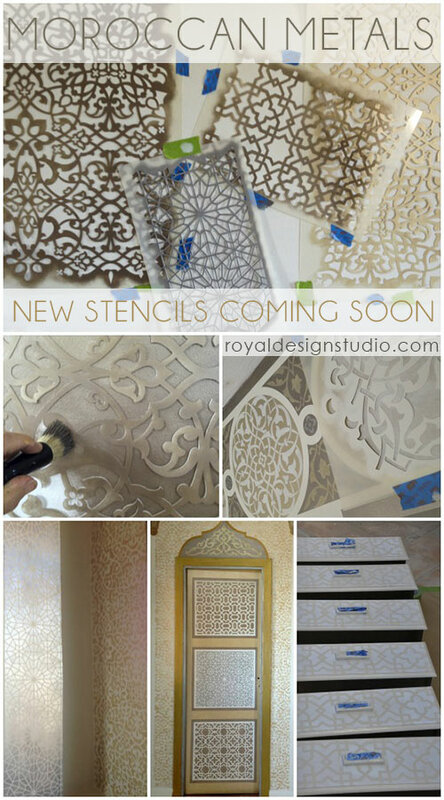 I CAN, however give you a sneek preview of some of the many lovely new Moroccan stencil patterns that were created especially for this project that will be available soon (end of May 2013) in our popular Moroccan Stencil Collection! Please stay tuned! 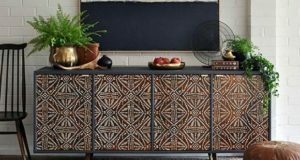 See some our our previous Moroccan stencil projects featured in Elle Decor and in this Raven & Lily fashion photoshoot. 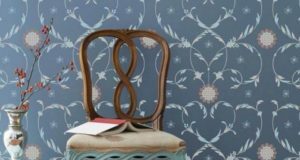 Read about all of our past Peacock Painting stencil adventures on the Design Amour blog. 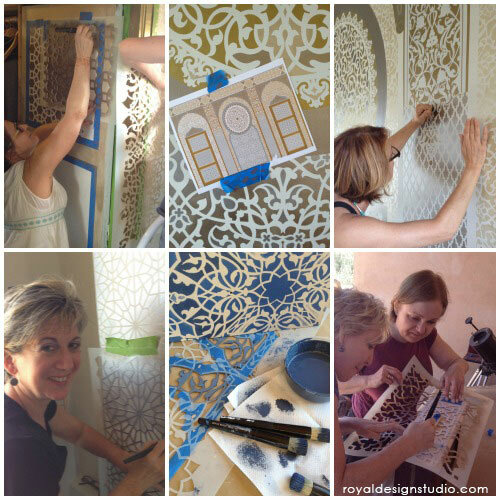 We are already planning our NEXT Moroccan stencil retreat for May 14. Read all about it and join the adventure!! Your stencils are beatiful. 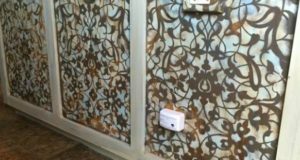 I have ivory coloured kitchen tiles and don’t to replace but update them witk stencilling. Where can I buy your stencils. Live in Pretoria, south africa. please where can I buy it¨?